Maintaining the integrity and reliability of equipment and assets is key to enabling higher levels of safety, efficiency and productivity within hazardous industries today. Maintenance (preventive, corrective and predictive) and Inspection activities are no longer a necessary evil, but a necessary pre-requisite to avoid unplanned shutdowns, remain competitive and reduce operating costs. Especially in potentially dangerous hazardous areas or harsh environments, the vision to achieve consistent maintenance and continuous improvement cannot rely on the old ways of paper forms and radios for efficient data exchange, communication & collaboration. However, help is at hand. 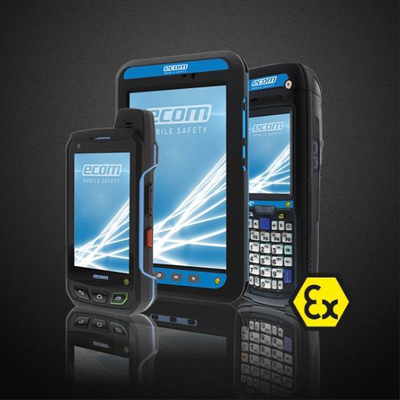 ecom´s Mobile Worker framework provides a flexible and integrated wireless ecosystem built around rugged and explosion-proof mobile computers (tablets, smart phones, PDAs), wireless peripheral devices and smart software applications. This combination enables new levels of collaboration by helping maintenance technicians to stay connected to supervisors and maintenance experts, and brings new levels of productivity and data integrity. Production losses caused by unplanned and planned downtime can be minimized in hazardous areas by connecting and integrating the data held in “information silos”, such as Excel spreadsheets and databases held by different sites, teams and people. Similarly, handheld computers working in “offline mode” (without access to wireless networks on the site) and handwritten notes are still being used to record data captured during periodic plant inspections. Both methods have the disadvantage that the onsite technician and remote offsite experts cannot rely on or share the latest centralized data to quickly identify and resolve problems or defects. For example, to achieve Operational Efficiency improvement for Pipelines, Oil and Gas production facilities, Chemical plants and Refineries requires that information is available to all those employees responsible for the operation and maintenance of the equipment when they need it. Easily fitting in your hand or on your arm, the world's first explosion-proof Android smartphone (Smart-Ex®01) provides an easy-to-use and secure platform to keep your workforce informed and improve maintenance & inspection data integrity. Supporting combined certification for Zone 1/21 and 2/22 and Division 1 and 2 on a single device, Smart-Ex®01 is ideal for global rollout projects and inspection contractors who need to visit and support customer sites around the world. Equipped as standard with the latest 4G/LTE and Bluetooth 4.0 BLE (Bluetooth Low Energy) wireless communications technologies, Smart-Ex®01 simplifies two-way communication and collaboration between mobile users out on the plant, the experts at the control center and the backend systems, helping to reduce travel and helicopter expenses and the associated travel/site exposure risk. Authorised personnel from technicians to supervisors and management have access to centralized real-time information when they need it. Technicians can perform maintenance on equipment, capturing maintenance/inspection results and viewing or receiving notifications and decisions by text or email, with the ability to call and talk to their team when they need to, without the additional hindrance of paper forms and radios. Such integrated ways of working help to prevent unwanted outages by improving work process effectiveness & visibility, reacting faster to anomalies, streamlining decision-making and ultimately reducing cost. Recurring service and maintenance tasks are also easier to do and document, with proof that the correct equipment has been visited, thanks to the integrated Smart-Ex® 01 NFC/RFID function and the optional built-in camera for photos, video capture, video calling, and even 1D/2D barcode scanning.